Liczba stron: 409 Jest to ujednolicona liczba stron, która ułatwi Ci porównanie długości książek. Każda strona Legimi to 200 słów. 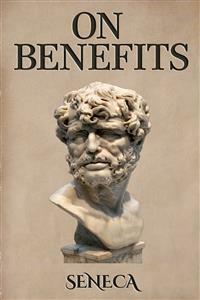 On Benefits (De Beneficiis) is a first-century work by Lucius Annaeus Seneca. It forms part of a series of moral essays (or Dialogues) composed by Seneca and is essential reading for students of Stoicism. On Benefits is about the nature of relative benefits to persons fulfilling the role in social exchange of either giver or receiver. The subject in Seneca's day might be thought of as social ethics, specifically Stoic ethics. On Benefits by Lucius Annaeus Seneca. Translated by Aubrey Stewart. First published in 1887. This edition published by Enhanced Media, 2016. Among the numerous faults of those who pass their lives recklessly and without due reflection, my good friend Liberalis, I should say that there is hardly any one so hurtful to society as this, that we neither know how to bestow or how to receive a benefit. It follows from this that benefits are badly invested, and become bad debts: in these cases it is too late to complain of their not being returned, for they were thrown away when we bestowed them. Nor need we wonder that while the greatest vices are common, none is more common than ingratitude: for this I see is brought about by various causes. The first of these is, that we do not choose worthy persons upon whom to bestow our bounty, but although when we are about to lend money we first make a careful enquiry into the means and habits of life of our debtor, and avoid sowing seed in a worn-out or unfruitful soil, yet without any discrimination we scatter our benefits at random rather than bestow them. It is hard to say whether it is more dishonourable for the receiver to disown a benefit, or for the giver to demand a return of it: for a benefit is a loan, the repayment of which depends merely upon the good feeling of the debtor. To misuse a benefit like a spendthrift is most shameful, because we do not need our wealth but only our intention to set us free from the obligation of it; for a benefit is repaid by being acknowledged. Yet while they are to blame who do not even show so much gratitude as to acknowledge their debt, we ourselves are to blame no less. We find many men ungrateful, yet we make more men so, because at one time we harshly and reproachfully demand some return for our bounty, at another we are fickle and regret what we have given, at another we are peevish and apt to find fault with trifles. By acting thus we destroy all sense of gratitude, not only after we have given anything, but while we are in the act of giving it. Who has ever thought it enough to be asked for anything in an off-hand manner, or to be asked only once? Who, when he suspected that he was going to be asked for any thing, has not frowned, turned away his face, pretended to be busy, or purposely talked without ceasing, in order not to give his suitor a chance of preferring his request, and avoided by various tricks having to help his friend in his pressing need? and when driven into a corner, has not either put the matter off, that is, given a cowardly refusal, or promised his help ungraciously, with a wry face, and with unkind words, of which he seemed to grudge the utterance. Yet no one is glad to owe what he has not so much received from his benefactor, as wrung out of him. Who can be grateful for what has been disdainfully flung to him, or angrily cast at him, or been given him out of weariness, to avoid further trouble? No one need expect any return from those whom he has tired out with delays, or sickened with expectation. A benefit is received in the same temper in which it is given, and ought not, therefore, to be given carelessly, for a man thanks himself for that which he receives without the knowledge of the giver. Neither ought we to give after long delay, because in all good offices the will of the giver counts for much, and he who gives tardily must long have been unwilling to give at all. Nor, assuredly, ought we to give in offensive manner, because human nature is so constituted that insults sink deeper than kindnesses; the remembrance of the latter soon passes away, while that of the former is treasured in the memory; so what can a man expect who insults while he obliges? All the gratitude which he deserves is to be forgiven for helping us. On the other hand, the number of the ungrateful ought not to deter us from earning men's gratitude; for, in the first place, their number is increased by our own acts. Secondly, the sacrilege and indifference to religion of some men does not prevent even the immortal gods from continuing to shower their benefits upon us: for they act according to their divine nature and help all alike, among them even those who so ill appreciate their bounty. Let us take them for our guides as far as the weakness of our mortal nature permits; let us bestow benefits, not put them out at interest. The man who while he gives thinks of what he will get in return, deserves to be deceived. But what if the benefit turns out ill? Why, our wives and our children often disappoint our hopes, yet we marry—and bring up children, and are so obstinate in the face of experience that we fight after we have been beaten, and put to sea after we have been shipwrecked. How much more constancy ought we to show in bestowing benefits! If a man does not bestow benefits because he has not received any, he must have bestowed them in order to receive them in return, and he justifies ingratitude, whose disgrace lies in not returning benefits when able to do so. How many are there who are unworthy of the light of day? and nevertheless the sun rises. How many complain because they have been born? yet Nature is ever renewing our race, and even suffers men to live who wish that they had never lived. It is the property of a great and good mind to covet, not the fruit of good deeds, but good deeds themselves, and to seek for a good man even after having met with bad men. If there were no rogues, what glory would there be in doing good to many? As it is, virtue consists in bestowing benefits for which we are not certain of meeting with any return, but whose fruit is at once enjoyed by noble minds. So little influence ought this to have in restraining us from doing good actions, that even though I were denied the hope of meeting with a grateful man, yet the fear of not having my benefits returned would not prevent my bestowing them, because he who does not give, forestalls the vice of him who is ungrateful. I will explain what I mean. He who does not repay a benefit, sins more, but he who does not bestow one, sins earlier. Much must be lost, for one that's rightly placed." In the former verse you may blame two things, for one should not cast them at random, and it is not right to waste anything, much less benefits; for unless they be given with judgement, they cease to be benefits, and, may be called by any other name you please. The meaning of the latter verse is admirable, that one benefit rightly bestowed makes amends for the loss of many that have been lost. See, I pray you, whether it be not truer and more worthy of the glory of the giver, that we should encourage him to give, even though none of his gifts should be worthily placed. "Much must be lost." Nothing is lost because he who loses had counted the cost before. The book-keeping of benefits is simple: it is all expenditure; if any one returns it, that is clear gain; if he does not return it, it is not lost, I gave it for the sake of giving. No one writes down his gifts in a ledger, or like a grasping creditor demands repayment to the day and hour. A good man never thinks of such matters, unless reminded of them by some one returning his gifts; otherwise they become like debts owing to him. It is a base usury to regard a benefit as an investment. Whatever may have been the result of your former benefits, persevere in bestowing others upon other men; they will be all the better placed in the hands of the ungrateful, whom shame, or a favourable opportunity, or imitation of others may some day cause to be grateful. Do not grow weary, perform your duty, and act as becomes a good man. Help one man with money, another with credit, another with your favour; this man with good advice, that one with sound maxims. Even wild beasts feel kindness, nor is there any animal so savage that good treatment will not tame it and win love from it. The mouths of lions are handled by their keepers with impunity; to obtain their food fierce elephants become as docile as slaves: so that constant unceasing kindness wins the hearts even of creatures who, by their nature, cannot comprehend or weigh the value of a benefit. Is a man ungrateful for one benefit? perhaps he will not be so after receiving a second. Has he forgotten two kindnesses? perhaps by a third he may be brought to remember the former ones also. He who is quick to believe that he has thrown away his benefits, does really throw them away; but he who presses on and adds new benefits to his former ones, forces out gratitude even from a hard and forgetful breast. In the face of many kindnesses, your friend will not dare to raise his eyes; let him see you whithersoever he turns himself to escape from his remembrance of you; encircle him with your benefits. As for the power and property of these, I will explain it to you if first you will allow me to glance at a matter which does not belong to our subject, as to why the Graces are three in number, why they are sisters, why hand in hand, and why they are smiling and young, with a loose and transparent dress. Some writers think that there is one who bestows a benefit, one who receives it, and a third who returns it; others say that they represent the three sorts of benefactors, those who bestow, those who repay, and those who both receive and repay them. But take whichever you please to be true; what will this knowledge profit us? What is the meaning of this dance of sisters in a circle, hand in hand? It means that the course of a benefit is from hand to hand, back to the giver; that the beauty of the whole chain is lost if a single link fails, and that it is fairest when it proceeds in unbroken regular order. In the dance there is one esteemed beyond the others, who represents the givers of benefits. Their faces are cheerful, as those of men who give or receive benefits are wont to be. They are young, because the memory of benefits ought not to grow old. They are virgins, because benefits are pure and untainted, and held holy by all; in benefits there should be no strict or binding conditions, therefore the Graces wear loose flowing tunics, which are transparent, because benefits love to be seen. People who are not under the influence of Greek literature may say that all this is a matter of course; but there can be no one who would think that the names which Hesiod has given them bear upon our subject. He named the eldest Aglaia, the middle one Euphrosyne, the third Thalia. Every one, according to his own ideas, twists the meaning of these names, trying to reconcile them with some system, though Hesiod merely gave his maidens their names from his own fancy. So Homer altered the name of one of them, naming her Pasithea, and betrothed her to a husband, in order that you may know that they are not vestal virgins. I could find another poet, in whose writings they are girded, and wear thick or embroidered Phrygian robes. Mercury stands with them for the same reason, not because argument or eloquence commends benefits, but because the painter chose to do so. Also Chrysippus, that man of piercing intellect who saw to the very bottom of truth, who speaks only to the point, and makes use of no more words than are necessary to express his meaning, fills his whole treatise with these puerilities, insomuch that he says but very little about the duties of giving, receiving, and returning a benefit, and has not so much inserted fables among these subjects, as he has inserted these subjects among a mass of fables. For, not to mention what Hecaton borrows from him, Chrysippus tells us that the three Graces are the daughters of Jupiter and Eurynome, that they are younger than the Hours, and rather more beautiful, and that on that account they are assigned as companions to Venus. He also thinks that the name of their mother bears upon the subject, and that she is named Eurynome because to distribute benefits requires a wide inheritance; as if the mother usually received her name after her daughters, or as if the names given by poets were true. In truth, just as with a 'nomenclature' audacity supplies the place of memory, and he invents a name for every one whose name he cannot recollect, so the poets think that it is of no importance to speak the truth, but are either forced by the exigencies of metre, or attracted by sweetness of sound, into calling every one by whatever name runs neatly into verse. Nor do they suffer for it if they introduce another name into the list, for the next poet makes them bear what name he pleases. That you may know that this is so, for instance Thalia, our present subject of discourse, is one of the Graces in Hesiod's poems, while in those of Homer she is one of the Muses. But lest I should do the very thing which I am blaming, I will pass over all these matters, which are so far from the subject that they are not even connected with it. Only do you protect me, if any one attacks me for putting down Chrysippus, who, by Hercules, was a great man, but yet a Greek, whose intellect, too sharply pointed, is often bent and turned back upon itself; even when it seems to be in earnest it only pricks, but does not pierce. Here, however, what occasion is there for subtlety? We are to speak of benefits, and to define a matter which is the chief bond of human society; we are to lay down a rule of life, such that neither careless openhandedness may commend itself to us under the guise of goodness of heart, and yet that our circumspection, while it moderates, may not quench our generosity, a quality in which we ought neither to exceed nor to fall short. Men must be taught to be willing to give, willing to receive, willing to return; and to place before themselves the high aim, not merely of equalling, but even of surpassing those to whom they are indebted, both in good offices and in good feeling; because the man whose duty it is to repay, can never do so unless he out-does his benefactor; the one class must be taught to look for no return, the other to feel deeper gratitude. In this noblest of contests to outdo benefits by benefits, Chrysippus encourages us by bidding us beware lest, as the Graces are the daughters of Jupiter, to act ungratefully may not be a sin against them, and may not wrong those beauteous maidens. Do thou teach me how I may bestow more good things, and be more grateful to those who have earned my gratitude, and how the minds of both parties may vie with one another, the giver in forgetting, the receiver in remembering his debt. As for those other follies, let them be left to the poets, whose purpose is merely to charm the ear and to weave a pleasing story; but let those who wish to purify men's minds, to retain honour in their dealings, and to imprint on their minds gratitude for kindnesses, let them speak in sober earnest and act with all their strength; unless you imagine, perchance, that by such flippant and mythical talk, and such old wives' reasoning, it is possible for us to prevent that most ruinous consummation, the repudiation of benefits. However, while I pass over what is futile and irrelevant I must point out that the first thing which we have to learn is, what we owe in return for a benefit received. One man says that he owes the money which he has received, another that he owes a consulship, a priesthood, a province, and so on. These, however, are but the outward signs of kindnesses, not the kindnesses themselves. A benefit is not to be felt and handled, it is a thing which exists only in the mind. There is a great difference between the subject- matter of a benefit, and the benefit itself. Wherefore neither gold, nor silver, nor any of those things which are most highly esteemed, are benefits, but the benefit lies in the goodwill of him who gives them. The ignorant take notice only of that which comes before their eyes, and which can be owned and passed from hand to hand, while they disregard that which gives these things their value. The things which we hold in our hands, which we see with our eyes, and which our avarice hugs, are transitory, they may be taken from us by ill luck or by violence; but a kindness lasts even after the loss of that by means of which it was bestowed; for it is a good deed, which no violence can undo. For instance, suppose that I ransomed a friend from pirates, but another pirate has caught him and thrown him into prison. The pirate has not robbed him of my benefit, but has only robbed him of the enjoyment of it. Or suppose that I have saved a man's children from a shipwreck or a fire, and that afterwards disease or accident has carried them off; even when they are no more, the kindness which was done by means of them remains. All those things, therefore, which improperly assume the name of benefits, are means by which kindly feeling manifests itself. In other cases also, we find a distinction between the visible symbol and the matter itself, as when a general bestows collars of gold, or civic or mural crowns upon any one. What value has the crown in itself? or the purple-bordered robe? or the fasces? or the judgment-seat and car of triumph? None of these things is in itself an honour, but is an emblem of honour. In like manner, that which is seen is not a benefit—it is but the trace and mark of a benefit. What, then, is a benefit? It is the art of doing a kindness which both bestows pleasure and gains it by bestowing it, and which does its office by natural and spontaneous impulse. It is not, therefore, the thing which is done or given, but the spirit in which it is done or given, that must be considered, because a benefit exists, not in that which is done or given, but in the mind of the doer or giver. How great the distinction between them is, you may perceive from this, that while a benefit is necessarily good, yet that which is done or given is neither good nor bad. The spirit in which they are given can exalt small things, can glorify mean ones, and can discredit great and precious ones; the objects themselves which are sought after have a neutral nature, neither good nor bad; all depends upon the direction given them by the guiding spirit from which things receive their shape. That which is paid or handed over is not the benefit itself, just as the honour which we pay to the gods lies not in the victims themselves, although they be fat and glittering with gold, but in the pure and holy feelings of the worshippers. If benefits consisted of things, and not of the wish to benefit, then the more things we received the greater the benefit would be. But this is not true, for sometimes we feel more gratitude to one who gives us trifles nobly, who, like Virgil's poor old soldier, "holds himself as rich as kings," if he has given us ever so little with a good will a man who forgets his own need when he sees mine, who has not only a wish but a longing to help, who thinks that he receives a benefit when he bestows one, who gives as though he would receive no return, receives a repayment as though he had originally given nothing, and who watches for and seizes an opportunity of being useful. On the other hand, as I said before, those gifts which are hardly wrung from the giver, or which drop unheeded from his hands, claim no gratitude from us, however great they may appear and may be. We prize much more what comes from a willing hand, than what comes from a full one. This man has given me but little, yet more he could not afford, while what that one has given is much indeed, but he hesitated, he put it off, he grumbled when he gave it, he gave it haughtily, or he proclaimed it aloud, and did it to please others, not to please the person to whom he gave it; he offered it to his own pride, not to me. As the pupils of Socrates, each in proportion to his means, gave him large presents, Aeschines, a poor pupil, said, "I can find nothing to give you which is worthy of you; I feel my poverty in this respect alone. Therefore I present you with the only thing I possess, myself. I pray that you may take this my present, such as it is, in good part, and may remember that the others, although they gave you much, yet left for themselves more than they gave." Socrates answered, "Surely you have bestowed a great present upon me, unless perchance you set a small value upon yourself. I will accordingly take pains to restore you to yourself a better man than when I received you." By this present Aeschines outdid Alcibiades, whose mind was as great as his Wealth, and all the splendour of the most wealthy youths of Athens. You see how the mind even in the straitest [sic] circumstances finds the means of generosity. Aeschines seems to me to have said, "Fortune, it is in vain that you have made me poor; in spite of this I will find a worthy present for this man. Since I can give him nothing of yours, I will give him something of my own." Nor need you suppose that he held himself cheap; he made himself his own price. By a stroke of genius this youth discovered a means of presenting Socrates to himself. We must not consider how great presents are, but in what spirit they are given. Men nowadays no longer secretly, but openly outrage the wives of others, and allow to others access to their own wives. A match is thought countrified, uncivilized, in bad style, and to be protested against by all matrons, if the husband should forbid his wife to appear in public in a litter, and to be carried about exposed to the gaze of all observers. If a man has not made himself notorious by a liaison with some mistress, if he does not pay an annuity to some one else's wife, married women speak of him as a poor-spirited creature, a man given to low vice, a lover of servant girls. Soon adultery becomes the most respectable form of marriage, and widowhood and celibacy are commonly practised. No one takes a wife unless he takes her away from some one else. Now men vie with one another in wasting what they have stolen, and in collecting together what they have wasted with the keenest avarice; they become utterly reckless, scorn poverty in others, fear personal injury more than anything else, break the peace by their riots, and by violence and terror domineer over those who are weaker than themselves. No wonder that they plunder provinces and offer the seat of judgment for sale, knocking it down after an auction to the highest bidder, since it is the law of nations that you may sell what you have bought. However, my enthusiasm has carried me further than I intended, the subject being an inviting one. Let me, then, end by pointing out that the disgrace of these crimes does not belong especially to our own time. Our ancestors before us have lamented, and our children after us will lament, as we do, the ruin, of morality, the prevalence of vice, and the gradual deterioration of mankind; yet these things are really stationary, only moved slightly to and fro like the waves which at one time a rising tide washes further over the land, and at another an ebbing one restrains within a lower water mark. At one time the chief vice will be adultery, and licentiousness will exceed all bounds; at another time a rage for feasting will be in vogue, and men will waste their inheritance in the most shameful of all ways, by the kitchen; at another, excessive care for the body, and a devotion to personal beauty which implies ugliness of mind; at another time, injudiciously granted liberty will show itself in wanton recklessness and defiance of authority; sometimes there will be a reign of cruelty both in public and private, and the madness of the civil wars will come upon us, which destroy all that is holy and inviolable. Sometimes even drunkenness will be held in honour, and it will be a virtue to swallow most wine. Vices do not lie in wait for us in one place alone, but hover around us in changeful forms, sometimes even at variance one with another, so that in turn they win and lose the field; yet we shall always be obliged to pronounce the same verdict upon ourselves, that we are and always were evil, and, I unwillingly add, that we always shall be. There always will be homicides, tyrants, thieves, adulterers, ravishers, sacrilegious, traitors: worse than all these is the ungrateful man, except we consider that all these crimes flow from ingratitude, without which hardly any great wickedness has ever grown to full stature. Be sure that you guard against this as the greatest of crimes in yourself, but pardon it as the least of crimes in another. For all the injury which you suffer is this: you have lost the subject-matter of a benefit, not the benefit itself, for you possess unimpaired the best part of it, in that you have given it. Though we ought to be careful to bestow our benefits by preference upon those who are likely to show us gratitude for them, yet we must sometimes do what we have little hope will turn out well, and bestow benefits upon those who we not only think will prove ungrateful, but who we know have been so. For instance, if I should be able to save a man's children from a great danger with no risk to myself, I should not hesitate to do so. If a man be worthy I would defend him even with my blood, and would share his perils; if he be unworthy, and yet by merely crying for help I can rescue him from robbers, I would without reluctance raise the shout which would save a fellow-creature. The next point to be defined is, what kind of benefits are to be given, and in what manner. First let us give what is necessary, next what is useful, and then what is pleasant, provided that they be lasting. We must begin with what is necessary, for those things which support life affect the mind very differently from, those which adorn and improve it. A man may be nice, and hard to please, in things which he can easily do without, of which he can say, "Take them back; I do not want them, I am satisfied with what I have." Sometimes, we wish not only to, return what we have received, but even to throw it away. Of necessary things, the first class consists of things without which we cannot live; the second, of things without which we ought not to live; and the third, of things without which we should not care to live. The first class are, to be saved from the hands of the enemy, from the anger of tyrants, from proscription, and the various other perils which beset human life. By averting any one of these, we shall earn gratitude proportionate to the greatness of the danger, for when men think of the greatness of the misery from which they have been saved, the terror which they have gone through enhances the value of our services. Yet we ought not to delay rescuing any one longer than we are obliged, solely in order to make his fears add weight to our services. Next come those things without which we can indeed live, but in such a manner that it would be better to die, such as liberty, chastity, or a good conscience. After these are what we have come to hold dear by connection and relationship and long use and custom, such as our wives and children, our household gods, and so on, to which the mind so firmly attaches itself that separation from them seems worse than death. If we have a free choice as to what to give, we should above all choose lasting presents, in order that our gift may endure as long as possible; for few are so grateful as to think of what they have received, even when they do not see it. Even the ungrateful remember us by our gifts, when they are always in their sight and do not allow themselves to be forgotten, but constantly obtrude and stamp upon the mind the memory of the giver. As we never ought to remind men of what we have given them, we ought all the more to choose presents that will be permanent; for the things themselves will prevent the remembrance of the giver from fading away. I would more willingly give a present of plate than of coined money, and would more willingly give statues than clothes or other things which are soon worn out. Few remain grateful after the present is gone: many more remember their presents only while they make use of them. If possible, I should like my present not to be consumed; let it remain in existence, let it stick to my friend and share his life. No one is so foolish as to need to be told not to send gladiators or wild beasts to one who has just given a public show, or not to send summer clothing in winter time, or winter clothing in summer. Common sense must guide our benefits; we must consider the time and the place, and the character of the receiver, which are the weights in the scale, which cause our gifts to be well or ill received. How far more acceptable a present is, if we give a man what he has not, than if we give him what he has plenty of! if we give him what he has long been searching for in vain, rather than what he sees everywhere! Let us make presents of things which are rare and scarce rather than costly, things which even a rich man will be glad of, just as common fruits, such as we tire of after a few days, please us if they have ripened before the usual season. People will also esteem things which no one else has given to them, or which we have given to no one else. When the conquest of the East had flattered Alexander of Macedon into believing himself to be more than man, the people of Corinth sent an embassy to congratulate him, and presented him with the franchise of their city. When Alexander smiled at this form of courtesy, one of the ambassadors said, "We have never enrolled any stranger among our citizens except Hercules and yourself." Alexander willingly accepted the proffered honour, invited the ambassadors to his table, and showed them other courtesies. He did not think of who offered the citizenship, but to whom they had granted it; and being altogether the slave of glory, though he knew neither its true nature or its limits, had followed in the footsteps of Hercules and Bacchus, and had not even stayed his march where they ceased; so that he glanced aside from the givers of this honour to him with whom he shared it, and fancied that the heaven to which his vanity aspired was indeed opening before him when he was made equal to Hercules. In what indeed did that frantic youth, whose only merit was his lucky audacity, resemble Hercules? Hercules conquered nothing for himself; he travelled throughout the world, not coveting for himself but liberating the countries which he conquered, an enemy to bad men, a defender of the good, a peacemaker both by sea and land; whereas the other was from his boyhood a brigand and desolator of nations, a pest to his friends and enemies alike, whose greatest joy was to be the terror of all mankind, forgetting that men fear not only the fiercest but also the most cowardly animals, because of their evil and venomous nature. Let us now return to our subject. He who bestows a benefit without discrimination, gives what pleases no one; no one considers himself to be under any obligation to the landlord of a tavern, or to be the guest of any one with whom he dines in such company as to be able to say, "What civility has he shown to me? no more than he has shown to that man, whom he scarcely knows, or to that other, who is both his personal enemy and a man of infamous character. Do you suppose that he wished to do me any honour? not so, he merely wished to indulge his own vice of profusion." If you wish men to be grateful for anything, give it but seldom; no one can bear to receive what you give to all the world. Yet let no one gather from this that I wish to impose any bonds upon generosity; let her go to what lengths she will, so that she go a steady course, not at random. It is possible to bestow gifts in such a manner that each of those who receive them, although he shares them with many others, may yet feel himself to be distinguished from the common herd. Let each man have some peculiarity about his gift which may make him consider himself more highly favoured than the rest. He may say, "I received the same present that he did, but I never asked for it." "I received the same present, but mine was given me after a few days, whereas he had earned it by long service." "Others have the same present, but it was not given to them with the same courtesy and gracious words with which it was given to me." "That man got it because he asked for it; I did not ask." "That man received it as well as I, but then he could easily return it; one has great expectations from a rich man, old and childless, as he is; whereas in giving the same present to me he really gave more, because he gave it without the hope of receiving any return for it." Just as a courtesan divides her favours among many men, so that no one of her friends is without some proof of her affection, so let him who wishes his benefits to be prized consider how he may at the same time gratify many men, and nevertheless give each one of them some especial mark of favour to distinguish him from the rest. I am no advocate of slackness in giving benefits: the more and the greater they are, the more praise they will bring to the giver. Yet let them be given with discretion; for what is given carelessly and recklessly can please no one. Whoever, therefore, supposes that in giving this advice I wish to restrict benevolence and to confine it to narrower limits, entirely mistakes the object of my warning. What virtue do we admire more than benevolence? Which do we encourage more? Who ought to applaud it more than we Stoics, who preach the brotherhood of the human race? What then is it? Since no impulse of the human mind can be approved of, even though it springs from a right feeling, unless it be made into a virtue by discretion, I forbid generosity to degenerate into extravagance. It is, indeed, pleasant to receive a benefit with open arms, when reason bestows it upon the worthy, not when it is flung hither or thither thoughtlessly and at random; this alone we care to display and claim as our own. Can you call anything a benefit, if you feel ashamed to mention the person who gave it you? How far more grateful is a benefit, how far more deeply does it impress itself upon the mind, never to be forgotten, when we rejoice to think not so much of what it is, as from whom we have received it! Crispus Passienus was wont to say that some men's advice was to be preferred to their presents, some men's presents to their advice; and he added as an example, "I would rather have received advice from Augustus than a present; I would rather receive a present from Claudius than advice." I, however, think that one ought not to wish for a benefit from any man whose judgement is worthless. What then? Ought we not to receive what Claudius gives? We ought; but we ought to regard it as obtained from fortune, which may at any moment turn against us. Why do we separate this which naturally is connected? That is not a benefit, to which the best part of a benefit, that it be bestowed with judgment, is wanting: a really great sum of money, if it be given neither with discernment nor with good will, is no more a benefit than if it remained hoarded. There are, however, many things which we ought not to reject, yet for which we cannot feel indebted. Let us consider, most excellent Liberalis, what still remains of the earlier part of the subject; in what way a benefit should be bestowed. I think that I can point out the shortest way to this; let us give in the way in which we ourselves should like to receive. Above all we should give willingly, quickly, and without any hesitation; a benefit commands no gratitude if it has hung for a long time in the hands of the giver, if he seems unwilling to part with it, and gives it as though he were being robbed of it. Even though some delay should intervene, let us by all means in our power strive not to seem to have been in two minds about giving it at all. To hesitate is the next thing to refusing to give, and destroys all claim to gratitude. For just as the sweetest part of a benefit is the kindly feeling of the giver, it follows that one who has by his very delay proved that he gives unwillingly, must be regarded not as having given anything, but as having been unable to keep it from an importunate suitor. Indeed, many men are made generous by want of firmness. The most acceptable benefits are those which are waiting for us to take them, which are easy to be received, and offer themselves to us, so that the only delay is caused by the modesty of the receiver. The best thing of all is to anticipate a person's wishes; the next, to follow them; the former is the better course, to be beforehand with our friends by giving them what they want before they ask us for it, for the value of a gift is much enhanced by sparing an honest man the misery of asking for it with confusion and blushes. He who gets what he asked for does not get it for nothing, for indeed, as our austere ancestors thought, nothing is so dear as that which is bought by prayers. Men would be much more modest in their petitions to heaven, if these had to be made publicly; so that even when addressing the gods, before whom we can with all honour bend our knees, we prefer to pray silently and within ourselves. It is unpleasant, burdensome, and covers one with shame to have to say, "Give me." You should spare your friends, and those whom you wish to make your friends, from having to do this; however quick he may be, a man gives too late who gives what he has been asked for. We ought, therefore, to divine every man's wishes, and when we have discovered them, to set him free from the hard necessity of asking; you may be sure that a benefit which comes unasked will be delightful and will not be forgotten. If we do not succeed in anticipating our friends, let us at any rate cut them short when they ask us for anything, so that we may appear to be reminded of what we meant to do, rather than to have been asked to do it. Let us assent at once, and by our promptness make it appear that we meant to do so even before we were solicited. As in dealing with sick persons much depends upon when food is given, and plain water given at the right moment sometimes acts as a remedy, so a benefit, however slight and commonplace it may be, if it be promptly given without losing a moment of time, gains enormously in importance, and wins our gratitude more than a far more valuable present given after long waiting and deliberation. One who gives so readily must needs give with good will; he therefore gives cheerfully and shows his disposition in his countenance. Many who bestow immense benefits spoil them by their silence or slowness of speech, which gives them an air of moroseness, as they say "yes" with a face which seems to say "no." How much better is it to join kind words to kind actions, and to enhance the value of our gifts by a civil and gracious commendation of them! To cure your friend of being slow to ask a favour of you, you may join to your gift the familiar rebuke, "I am angry with you for not having long ago let me know what you wanted, for having asked for it so formally, or for having made interest with a third party." "I congratulate myself that you have been pleased to make trial of me; hereafter, if you want anything, ask for it as your right; however, for this time I pardon your want of manners." By so doing you will cause him to value your friendship more highly than that, whatever it may have been, which he came to ask of you. The goodness and kindness of a benefactor never appears so great as when on leaving him one says, "I have to-day gained much; I am more pleased at finding him so kind than if I had obtained many times more of this, of which I was speaking, by some other means; I never can make any adequate return to this man for his goodness."